NOW AVAILABLE: Rare archival footage of the construction of Lightning House 2001. Click here for details. I am continuing with the theme of revisiting old projects as a way to reflect on my current trajectory, see old friends, and make new discoveries. 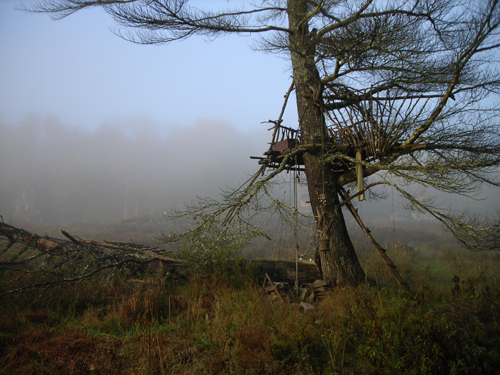 This past fall I traveled to upstate Pennsylvania to assess the condition of a tree house I built in 2001 at Mildred’s Lane Historical Society, the home and experimental rural project of my good friends the artists J. Morgan Puett and Mark Dion . I had received a distressed message from Morgan that the host tree, a 100 year old white pine, had been struck by lightning and that the tree had died. Though one trunk of the forked tree fell to the ground, my tree house had survived unharmed. Morgan wanted me to come East to assess the damage and consider designing a new project around either preserving or salvaging the tree and tree house in its dramatic state of decline. I was not surprised by the news. The tree bore the scars of having been previously struck before I built the structure, and the secondary trunk was already leaning at a rakish angle. 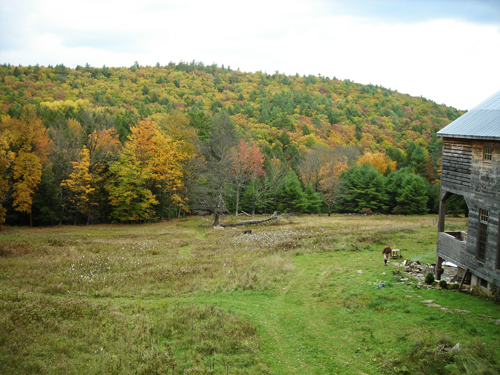 I chose to use the tree regardless at the time, due to its visual proximity to the main house, aural proximity to the stream, and its austere presence in a meadow criss-crossed by dry-laid stone walls. 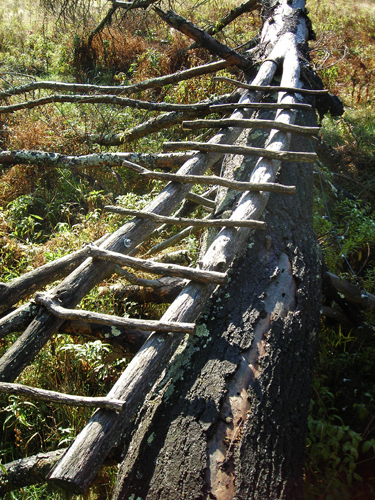 I designed the structure to cantilever off of the main trunk in anticipation of the leaning trunk eventually falling, and made only one supporting connection to the leaning trunk. I did not anticipate the death of the tree from lightning and was startled by the haunting rawness of the bare tree and newly exposed tree house against the cascade of autumn colors. The functionality of a thing by definition incorporates/embodies its decomposition. I had built the tree house in ten rainy days in May 2001 with the help of a crew assembled by Mark and Morgan for the final push over a long weekend . The crew included the artists Bob Braine, Alison Smith, Hope Ginsburg, Brian and Rebecca Purcell and several others who came up from New York for the tree house festivities and Morgan’s famous Southern hospitality. 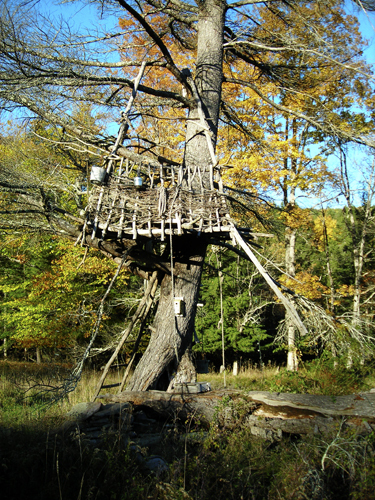 I had developed the tree house program after completing several ambitious public projects, culminating in the Tool Barn at the Edible Schoolyard. While these projects allowed me to experiment, they were taxing in that they required the complex management of multiple entities, including funding organizations, public institutions, neighbors, municipalities and permit processes. I wanted to radically loosen the reigns on design requirements so that emphasis would shift to the real time relationships at the heart of collaborative, community-based making. The tree house projects began as a ‘thought experiment’ by observing what conditions put people at their best, regardless of their background or skill set. I wanted to see what a small group could build together as an extension of simply hanging out over a few days with no distractions. Everybody knows exactly what to do when the parameters of tree house construction are narrowed to the use of hand tools, materials found within walking distance in the forest, and no penetrations to the tree. Some people forage, some climb, some cook, some entertain. The actual building emerges as the boid-like residue of hanging out, talking and strategizing, and survives as the record of its own making, containing the memories of a shared, lived experience in and around a tree. 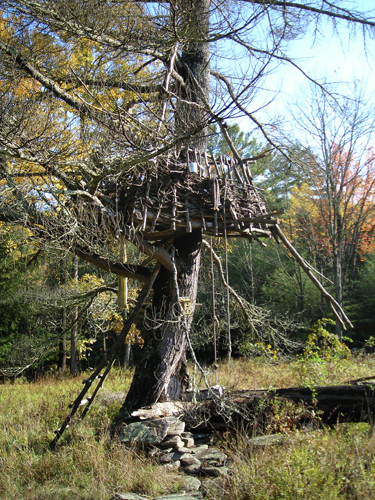 For the un-making of Lightning Tree House at Mildred’s Lane, I would like to gather the same group of people, disassemble the structure, document the parts as anthropological artifacts, and incorporate them into a new and more inhabitable structure in a related white pine. I hope to achieve this as artist in residence at Mildred’s Lane in 2009, and will maintain a daily log of the process on these pages while it happens. Over the coming months, I will be featuring products I have developed through this and other tree house projects, some of which will be available for sale as GOODS. Posted by Scott on May 5th, 2008, at 12:55 pm, and filed under all, bioregion/vernacular, expedition, material lifecycle, material provenance, mildred's lane, visceral inquiry, waste streams.